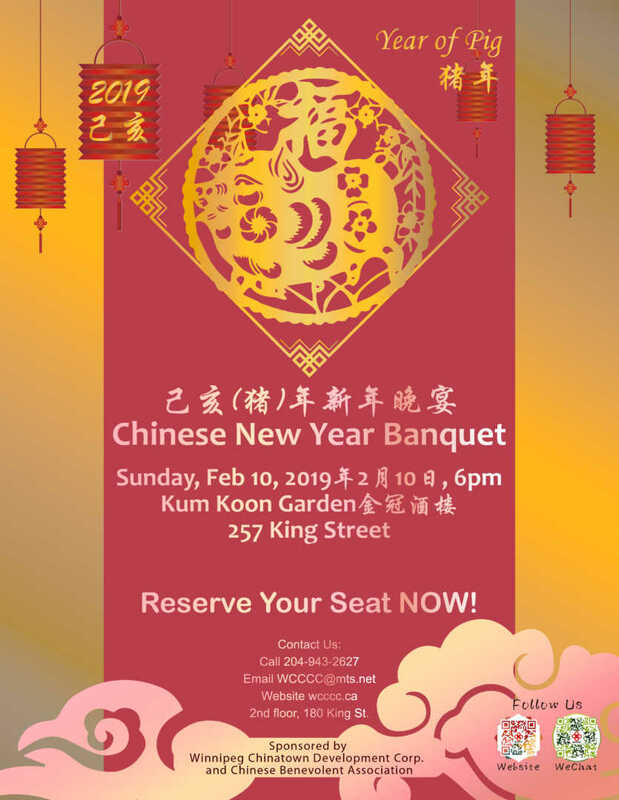 The Winnipeg Chinese Cultural & Community Centre is again hosting Chinese New Year celebrations! For the past eleven years, Canada Post releases a stamp commemorating the Lunar New Year – this year it’s the Year of the Pig. LOCATION: Kum Koon Garden Restaurant, 257 King St.
And thus, according to popular Chinese legend, we learn how the pig became the final animal of the 12-year lunar cycle. The other animals, upon hearing that the Emperor would name each lunar year in order of each animal finishing the race across the river, had feverishly responded to his challenge. This tale is beautifully expressed within Canada Post’s soon-to-be-released “Lunar New Year: Year of the Pig” stamp, the eleventh issue within a 12-year series. From the lantern-inspired shape of the souvenir sheet to the shadowed figure of the Jade Emperor, Vancouver-based Signals Design has carefully integrated the detail and spirit of both the legend and the pig into the stamp’s design. The second conceptual element that the stamp’s design reflects is that of cloisonné, a unique art form that is thought to have originated in Beijing during the Yuan Dynasty (1271-1368). Alain Leduc, Manager of Stamp Design and Production at Canada Post, notes that “this sophisticated enameling technique integrates gold or bronze metal strips and is an extremely popular technique still used today in Chinese porcelain beads, vases and artwork. Just as flowers are often a focal detail in cloisonné art, the stamp’s pig mimics this art form with foil-stamped flowers covering his body.” Working closely together, Leduc and the designers at Signals followed through on these conceptual elements until the last drop of ink was dry on the press sheet. From undertaking focus groups with members of the Chinese community to testing unique printing processes that would replicate the cloisonné style, both parties were committed to producing an exceptional product. The result is a thoughtful design, which aptly commemorates 2007, the Year of the Pig, in a celebration set of collectibles that includes a domestic stamp, an international stamp, a souvenir sheet, an official first day cover (OFDC), a souvenir sheet OFDC, an uncut press sheet and a Royal Canadian Mint coin.